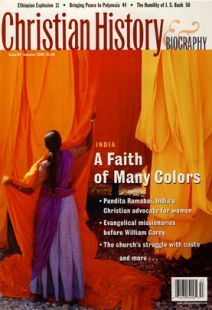 Resources for further study on Christianity in India. Case studies from an Indian Christianity that defies our limited palette. Rediscovered Bach aria, buried Saxon church, and digitizing one of the world’s oldest New Testament manuscripts. How a struggling remnant of 150 grew into a church of around 10,000 believers. If you don’t know the inner strength of an Indian woman with a divine call, you haven’t met Pandita Ramabai. The first evangelical missionary to India set out to prove that the Gospel does not destroy culture but transforms it from within. How indigenous Christian movements radically transformed entire communities. Chronology of Christianity in India. Catholicism emerged out of decline and disarray to become the largest Christian community in India. How do Christian beliefs relate to Indian philosophy and culture? These Indian thinkers came up with different answers. Combining the lifestyle of an ascetic “holy man” with the devotion of a Christian visionary, Sadhu Sundar Singh became for many a symbol of authentically Indian Christianity. For India’s “untouchable” Christians, relating their faith to the surrounding culture was no simple matter. British missionary John Williams pioneered the spread of Christianity in the South Pacific by employing the zeal of Polynesian converts.